Croatia, officially the Republic of Croatia, is a country in Central and Southeast Europe. Its capital (and largest city) is Zagreb. It borders the Adriatic Sea, between Bosnia and Herzegovina and Slovenia. The lands that today comprise Croatia were part of the Austro-Hungarian Empire until the close of World War I. In 1918, the Croats, Serbs, and Slovenes formed a kingdom known after 1929 as Yugoslavia. Following World War II, Yugoslavia became a federal independent Communist state under the strong hand of Marshal TITO. Although Croatia declared its independence from Yugoslavia in 1991, it took four years of sporadic, but often bitter, fighting before occupying Serb armies were mostly cleared from Croatian lands. Under UN supervision, the last Serb-held enclave in eastern Slavonia was returned to Croatia in 1998. In January 2008, Croatia assumed a nonpermanent seat on the UN Security Council for the 2008-09 term, and in April 2008 it joined NATO. Croatia is a candidate for eventual EU accession. For silver and base metal coins of Croatia, please look at our original Chard Coins website. 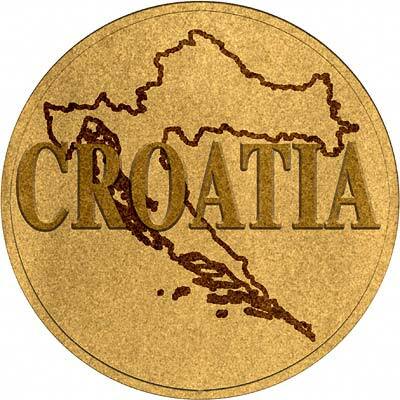 We make an active market in almost all world coins, gold or otherwise, including Croatian gold coins. If you have any of these coins to sell, please contact us, or post them to us for appraisal and offer.